Sterling silver with brooch closure. 6" x 1/16" x 2 ½". Weight: 40 grams. Chus Burés, inspired by this design process, has created for the Whitney Shop his own interpretation of the zig-zag, but with jewelry responding endlessly to the body or apparel on which it rests. 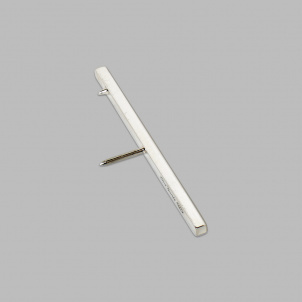 This stylish brooch adds a minimalist flair to any outfit. In 2013, the Whitney introduced a new, dynamic graphic identity. At its center is a distinctive, zig-zag line that responds to images and text in ever-changing ways, typically settling into a form that resembles the letter W.
Chus Burés was introduced to us through the artist Carmen Herrera during the 2016 exhibition, Carmen Herrera: Lines of Sight.